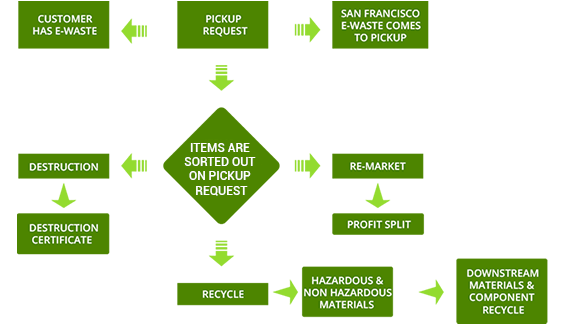 Eastbay E-waste works under the rules and norms set in place by the Blue Star Company Inc. We assist households, companies, industries and government entities to recycle, remarket and reuse their electronic waste. We provide businesses with expert consultation on how they can become data self-accommodating and how they can effectively put in practice data destruction regulations. We are proficient in all sorts of electronic recycling, hard drive formatting, hardware and hard drive destruction, abetment of laptops and desktop recycling and facilitation of 100% data security during the e-waste recycling process. Eastbay E-waste doesn’t leave any stone unturned and any aspect uncovered when the e-waste enters our facility for recycling. Each product’s identity is stored in our security-caged database allowing us to shell out our customers with the unprecedented, unbeatable and qualified asset management and data destruction services. We also solidify the roots of the fact that all the services are carried out in strict compliance with the environmental laws set up by the government. We have provided a flowchart below which will help you to understand the entire process. The first step in the wholeprocess is the recycle request, processing of the recycle request and the e-waste pickup from your specified location. Second, as soon as your e-waste enters our facility, our technicians get down to the task of entering the product model number, serial number, and location the unit came from into our database. Third, your electronic waste goes through an intelligent sorting and segregation process based on its category. Forth, our highly-trained and experienced workers process the technology and access the worth of the asset based on its current condition. Fifth, the product evaluation is carried out to assimilate whether it should to dismantled, remarketed or recycled. Sixth, the product is sorted out based on the degree of its hazardousness and toxic profile, later according to which they are processed and recycled. Once your e-waste, as per its condition, is destructed, remarketed or recycled, a detailed report of the same is uploaded on the website for your perusal and evaluation. Eastbay E-wastestrives to maintain transparency and exude authenticity while carrying out their practices to give a customer the satisfaction they are looking for.